For object falling without air resistance, it will undergo free fall with a constant acceleration of 10 ms^(-2). Initially, the only force acting on the falling object is its own weight. All free-falling objects increase their speed at the same rate of 10m/s every second, that is, they experience constant acceleration of 10ms^(-2) (acceleration due to gravity). All free-falling objects dropped from the same height will hit the ground at the same time with the same speed. Air resistance always opposes the motion of a moving object. Initially, the only force acting on the falling object is its own weight and it accelerates downwards at 10 ms^(-2) (Diagram A). As its speed increases, air resistance increases. Therefore, resultant force acting downwards is smaller, and hence accelerates at a rate less than 10 ms^(-2) (Diagram B & C). When air resistance balances the weight, resultant force is 0 N and acceleration is 0 ms^(-2). 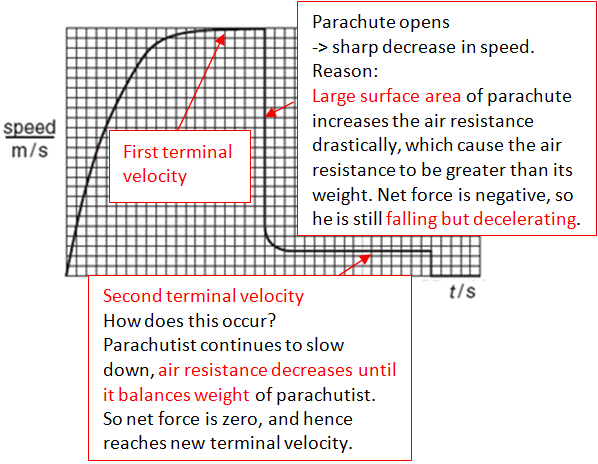 Thus, the object falls with constant speed, which is called terminal velocity (Diagram D). (1) The object accelerates at a rate of 10ms^(-2) initially, then, its acceleration gradually decreases to 0 ms^(-2) due to increasing air resistance. (2) An object reaches terminal velocity only when the height is sufficient for it to fall. - Surface area of the falling object. The greater it is, the shorter the time it reaches terminal velocity and hence smaller terminal velocity. - Mass of the falling object. The bigger it is, the longer the time it reaches terminal velocity and hence larger terminal velocity. (2) After opening the parachute.